The Volvo S60 is the first model to come out since Ford sold the company to Chinese-owned Geely. Engine: Turbocharged, in-line six-cylinder with 300 horsepower and 325 pound-feet of torque. Speed: 0 to 60 mph in 5.5 seconds. Gas mileage per gallon: 18 city; 26 highway. Best feature: Romping ride in subdued package. Worst feature: Where are the behind-the-wheel paddles? Target buyer: The sports sedan seeker who wants a BMW and Audi alternative. Until I drove the S60 sport sedan, the only fun I've ever had in a Volvo was behind the wheel of a careening double-decker bus. More than a decade ago I drove Volvo's entire line at its Gothenburg, Sweden, headquarters. It was a sleepy, torpid affair, as you might expect from the world's most boring (yet safe -- really, really safe!) automobiles. Finally someone asked if I wanted a crack at the "big toys" -- Volvo's heavy equipment division -- which sent me around a test track in my own version of the movie "Speed." Awesomeness that nearly made up for the lackluster cars. Lately, though, colleagues have been insisting that the updated S60 sports sedan is different -- a fun Volvo. I filed that phrase between "friendly fire" and "jumbo shrimp." Only they're right. The S60 T6 sport sedan is a sleeper agent, a 300-hp, BMW-challenging sports car camouflaged by geeky frame glasses and Volvo duds Clark Kent might like. Underneath the exterior, the T6 model has an "S" emblazoned on its chest, courtesy of a turbocharged, inline six-cylinder. This thing was made to run. Pounce on the gas and -- whammo! -- 60 mph (96kph) comes on in 5.5 seconds, leaving BMW 3-series drivers scratching their heads. Who saw that coming? Audi was once the European manufacturer most identified with superhero sports cars with hidden identities. The brand's bravura redesign made its products a lot more interesting, but had some fans feeling left behind. The sedan is crisp and handsome, with a stance that leans forward. It has a particularly good-looking rear, a mix of sharp lines and concave hollows that looks hand-crafted. Dynamic, but not shriekingly so. It's good timing, as the Swedish car industry has had a hard ride lately. Saab was sold off by General Motors Co. in a last-minute deal to Spyker Cars NV, and has seen production delays due to unpaid bills. A recent drive in the updated 9-5 sedan left me disappointed in the flimsy-feeling interior, a hallmark of GM from a few years ago. The S60, meanwhile, is the first model to come out since Ford sold Volvo to Chinese-owned Geely. Nonetheless, the design and engineering departments remain in Sweden, just as they had underneath Ford. The T6 model starts at 44,900 euros in Europe. It gets the six-cylinder engine and all-wheel drive. The front-wheel-drive, five-cylinder T5 has 250 hp and starts at 33,950 euros. The awd makes a big difference. 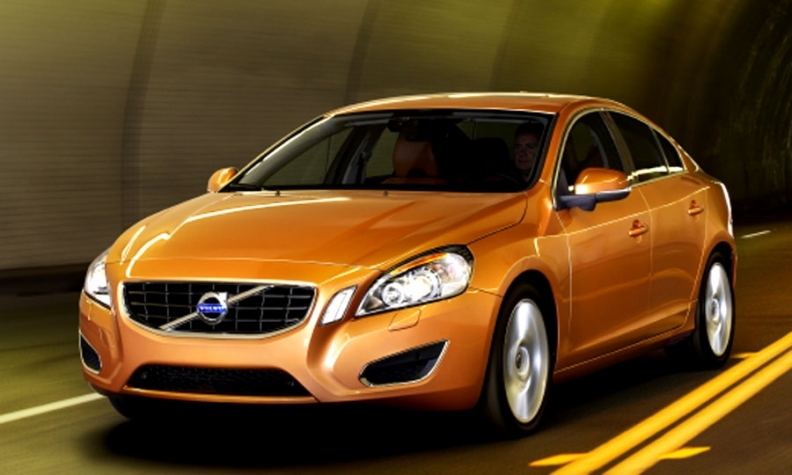 You can feel the S60 push and pull you simultaneously and relentlessly down the road. It stays perfectly flat on big sweeping curves. I'll admit to my surprise. After 100 miles I wanted to drive 100 more. Quite unlike the Saab, which left me feeling a little blue for a model I once liked. The Volvo would benefit from a swifter transmission, as the six-speed automatic takes a heartbeat to kick down when you suddenly need a spurt to burst through traffic. Behind-the-wheel paddles would be nice, too. The steering-wheel effort can be adjusted electronically -- I put it on the heaviest setting. The on-center feel is a bit hazy and takes some getting used to. My tester was a burnt-orange color (vibrant copper metallic, according to the company), with a nice brown-leather interior that seems like a 1970s throwback, but in a cool way. I would totally order it in the combination. The S60 has an adequate navigation system that's well integrated into the console. The instrument cluster is a bit dull, but the controls only take a moment to master. There's a lane-departure warning, adaptive cruise control and a distance alert. Those can also be turned off with a button on the console, as simply paying attention to the road does wonders. As carmakers change hands among corporate (and international) owners, it's nice to discover that the final result doesn't always yield products that are watered down. In Volvo's case, I find it more potent.